I know how difficult it is to find the perfect gift for your favorite cocktail geek. Seems they already have many more Cobbler cocktail shakers than they know what to do with or will ever need. And if you want to give them something different this year than their favorite bottle of liquor, again, why not consider their love of drinking in Los Angeles? 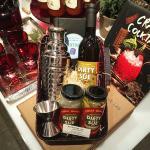 Here’s a bunch of booze-related gift ideas that are all created locally! 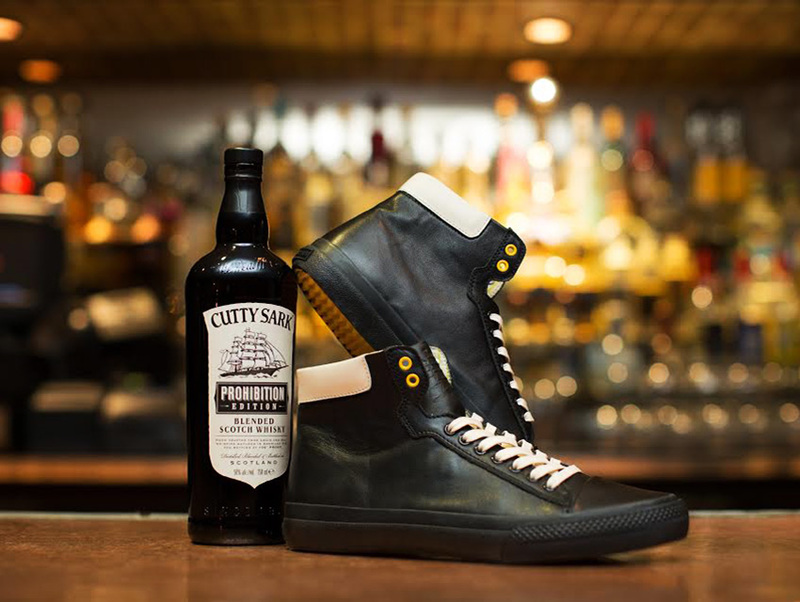 If your buddies are bartenders or aspire to be, they will really appreciate these new hi-tops created by Los Angeles shoe designer Generic Surplus and inspired by Cutty Sark Prohibition Edition Whiskey as well as bartenders like Jason Littrell of New York’s Death and Co. Not only are these sneakers oh-so stylish in black leather with pops of off-white and yellow, but they also are made with arduous bar work in mind: cushy for comfort during all-night shifts, nonslip soles to adhere despite wet surfaces, and water-resistant black leather for easy cleanup. The limited first run of this sold out, so they’ve re-released it, thank goodness. Only thing is, if you order it now, it won’t ship til first week of January. 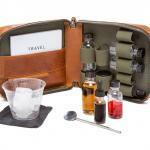 Proprietors LLC has been expanding its dominion from award-wining cocktail bars to an entire way of life: creating a rucksack, book, lip balm, and now this travel cocktail kit for in-flight imbibing. Forget those airplane cocktail hacks because everything you need to make your favorite drink will be right here. The kit comes with nine bottles (two of which have eyedroppers for your bitters), a mixing spoon, and a book with 15 cocktail recipes and instructions on how to pack the kit for different trips. This is the kind of gift that you just make your friend open right away. It has all the fixings for an instant cocktail party (just add the gin or vodka): Dirty Sue olive juice, garlic/jalapeno olives, jalapeno stuffed onions, as well as a jigger, a mini shaker, and a cocktail recipe book. This basket is available at Cocktail Lab on Beverly Boulevard while Bar Keeper in Silver Lake has its own vodka martini basket ($90) which comes with vodka, dry vermouth, lemon, cocktail glasses, and bar tools, as well as a jar of Dirty Sue olives. Dirty Sue, for those who didn’t know, is owned and was founded by Jones bartender Eric Tecosky. The star of National Geographic Channel’s Chug and creator of the jacket Zane Lamprey is an expert drinker, having traveled the world for drinking shows like Three Sheets and Drinking Made Easy, so he knows what every booze-lover needs when on the road. 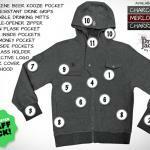 There’s a zipper that opens bottles, built-in gloves with no-slip grip, and even an insulated beer koozie pocket. Unfortunately, this jacket, which is available on Kickstarter through December 22, isn’t scheduled to ship til March 2015, but as a one-of-a-kind item, it’ll be worth the wait. 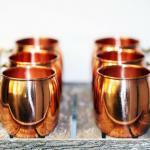 What better way to celebrate drinking in the city than with genuine copper mugs made in L.A.? Copper Mug Co. creates hand-crafted pure copper mugs — none of that cheap nickel-plated stuff for your friend. These babies will be the star of your Moscow Mule gift basket. If it were up to whiskey lovers, this would be how all spa treatments would go: Enjoy a whiskey-and-ginger salt scrub before a deep-tissue massage, and then follow that up with a whiskey-ginger cocktail made with the Ritz Carlton’s house-aged spirits. Fortunately, it’s not whiskey in the scrub, because, duh, actual whiskey goes in your mouth, but rather the elements of it — barley, buckwheat, and rye. After all this holiday craziness, this special tequila massage will be a welcome relief. 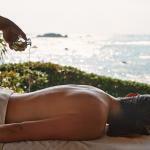 For this treatment, which originated from the Four Seasons in Punta Mita, Mexico, you get two ounces of tequila applied to your feet, back, and belly. The idea is that it will cleanse and detoxify you, perfect as a luxurious hangover cure. If you want to really splurge on your friend, there’s also the Punta Mita Retreat ($270) ,which involves a margarita scrub. Previous article2014 in Rewind: Looking Back at a Year of Culture in L.A.